Was Brazil�s �stealth concordat� the price for electing Dilma? 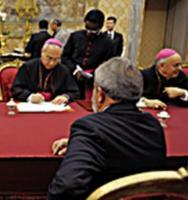 Brazil’s President Lula da Silva watches as Archbishop Dominique Mamberti, Vatican Secretary for Relations with States, signs the concordat in the Vatican’s ornate Treaty Room. The High Contracting Parties will continue to be represented in their diplomatic relations by an Apostolic Nuncio accredited with the Republic of Brazil, and an Ambassador of Brazil accredited with the Holy See, with the immunities and guarantees provided by Vienna Convention on Diplomatic Relations of April 18, 1961, and other international laws. Based on the right to religious freedom, the Federal Republic of Brazil recognises the right of the Catholic Church to carry out its apostolic mission, guaranteeing the public exercise of its activities, in accordance with the laws of Brazil. The Federal Republic of Brazil reaffirms the legal personality of the Catholic Church and all Ecclesiastical Institutions that have such a personality in accordance with Canon Law, where this does not contravene the Brazilian Constitution and laws, examples [of such institutions] being the Episcopal Conference, Ecclesiastical Provinces, Archdioceses, Dioceses, Personal or Territorial Prelatures, and Apostolic Vicariates and Prefectures, Apostolic Administrations, Personal Apostolic Administrations, Missions Sui Iuris [independent missions], the Military Ordinary and Ordinary for the faithful of other rites, Parishes, Institutes of Consecrated Life and Societies of Apostolic Life. § 1. The Catholic Church can freely create, modify or abolish all Ecclesiastical Institutions mentioned at the head of this article. § 2. The legal personality of Ecclesiastical Institutions of the Church will be recognised by the Federal Republic of Brazil through the registry entry, insofar as they are created in accordance with Brazilian law, and the government is forbidden to deny them recognition or the registration of the document attesting to their creation; furthermore, all alterations of this document [i.e., of the rules of these institutions] must also be registered. The Holy See declares that no ecclesiastical district will depend on a Brazilian Church bishop whose seat is located in foreign territory. The ecclesiastical juridical persons recognised according to Article 3, who, in addition to religious purposes, also have the purpose of assistance and social solidarity, shall be entitled to pursue their own activities and enjoy all of the rights, immunities, exemptions and benefits granted to entities with purposes of a similar nature under Brazilian law, provided they fulfil the requirements and obligations of Brazilian law. The High [Contracting] Parties recognise that the historical, artistic and cultural heritage of the Catholic Church, and the documents preserved in its archives and libraries, are an important part of the Brazilian cultural heritage and [the Parties] will continue to cooperate to protect, value and promote the [cultural] contribution of property, both movable and immovable, of the Catholic Church or other ecclesiastical juridical persons deemed by Brazil as part of its cultural and artistic heritage. § 1. The Federal Republic of Brazil, in accordance with the principle of cooperation, recognises that the intrinsic purpose of the church goods mentioned in the head of this article should be protected by Brazilian law, while not hindering other ends that might arise from their cultural nature. § 2. The Catholic Church, aware of the value of its cultural assets, is committed to facilitating access to them for those who want to know and study them, so long as their religious purposes are protected, as well as the need to safeguard and preserve their archives. The Federal Republic of Brazil shall, in accordance with to its laws, take the measures necessary to ensure the protection of places of worship of the Catholic Church, as well as its liturgy, symbols, images and objects of veneration, against all forms of violation, disrespect and illegitimate use. § 1. No building, dependency or object related to the Catholic creed can, so as long as the social ends of the property and the [requirements of] the law are met, be demolished, occupied, transported, subject to alteration or consigned by the State and public bodies to different purposes, except due to the needs or utility of the state or because of social needs, in accordance with the Brazilian Constitution. The Catholic Church, with regard for the common good of the Brazilian society, especially the most needy citizens, undertakes, subject to the requirements of the law, to give pastoral care to the faithful who are committed to institutions of health, welfare, education or similar ones, or detained in prison or similar institutions, while abiding by the rules of each institution, and who cannot engage in normal religious practice and request this. The Federal Republic of Brazil guarantees the Catholic Church the right to perform this service, which is intrinsic to its mission. Reciprocal recognition of titles and qualifications at undergraduate and graduate levels will be subject to the requirements of both the laws of Brazil and those of the Holy See [Catholic canon law]. The Catholic Church, mindful of the principle of cooperation with the State, will continue to put its educational institutions, of all levels, at the service of society, according to their purposes and the requirements of Brazilian law. § 1. The Federal Republic of Brazil recognises the right of the Catholic Church to establish and manage seminaries and other ecclesiastic institutes of education and culture. § 2. The recognition of civil effects of studies, degrees and qualifications obtained in the seminaries and institutes listed above is governed by Brazilian law, in parity with studies of a similar nature. The Federal Republic of Brazil, observing the right to religious freedom, cultural diversity and religious plurality in the country, respects the importance of religious education with a view to the essential [religious] formation of the person. § 1. The religious education, both Catholic and of other religious confessions, to be optional, is a regular discipline in normal hours of state schools in primary education, so long as the respect for religious diversity of Brazil is ensured, in accordance with the Constitution and other laws, without any form of discrimination. Marriage concluded in accordance with Canon Law, which also meets the requirements for marriage established by Brazilian law, produces civil effects, provided that it is registered [individually] in its own registration, being valid as soon as it is celebrated. § 1. The approval of ecclesiastical judgments in matrimonial matters, confirmed by the highest judicial authority of the Holy See [the Apostolic Signature], will be performed in accordance with Brazilian legislation concerning the acceptance of foreign judgments. Secrecy of the priestly office is guaranteed, especially the sacramental confession. The Federal Republic of Brazil declares its commitment to the allocation of spaces for religious purposes to be specified in the instruments of urban planning to be established in the City Master Plans. For ecclesiastical persons, as well as for the assets, income and services related to their essential purpose, there is recognition of the guarantee of tax immunity in accordance with the Brazilian Constitution. § 1. For tax purposes, the legal persons of the Catholic Church engaged in non-profit social and educational activities will receive the same treatment and benefits granted to charitable organisations recognised by the Brazilian legal system, including the requirements and obligations required for immunity and exemption purposes. I - The relationship between the ordained ministers or believers consecrated by vows and the Dioceses and Religious Institutes or equivalent is of religious nature and therefore, in accordance with the Brazilian labour legislation, does not generate by itself, an employer-employee bond, unless a distortion of the ecclesiastical institution is proven. II - The tasks of apostolic, pastoral, liturgical, catechetical, assistance for the benefit of humanity and the like may be performed on a voluntary basis, while complying with the Brazilian labour legislation. The Bishops, in the exercise of their pastoral ministry, may invite priests, members of religious institutes and lay people, who have not Brazilian citizenship, to serve in the territory of their dioceses, and ask the Brazilian authorities on their behalf, to grant the visa to perform pastoral activity in Brazil. § 1. In consequence of the formal request of the Bishop, according to Brazilian law, a permanent or temporary visa shall be granted, as appropriate, for the reasons explained above. This Agreement may be supplemented by arrangements agreed between the High Contracting Parties. § 1. Departments of the Brazilian Government within their powers and the National Conference of Brazilian Bishops, duly authorised by the Holy See, may conclude agreements on specific issues to implement this Agreement. Any differences in the application or interpretation of this Agreement shall be settled by direct diplomatic negotiations. This Agreement shall enter into force upon exchange of instruments of ratification, subject to the existing legal situation and established under Decree No. 119-A of 7 January 1890 and the Agreement between the Federal Republic of Brazil and the Holy See on Religious Assistance to the Armed Forces of 23 October 1989. Concluded in the Vatican City, on the 13th day of November 2008 in two originals, in Portuguese and Italian, both texts being equally authentic.